Newtonmore took another major step towards regaining the Marine Harvest Premiership title with a 2-0 victory over champions Kinlochshiel at The Eilan. Lovat maintained the deficit at four points with a 7-2 humbling of Caberfeidh. 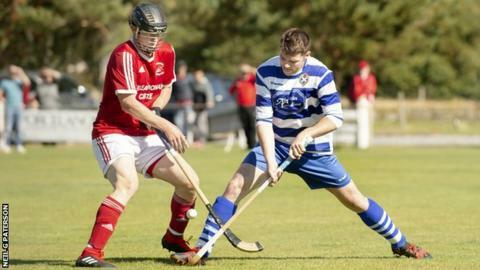 Kyles pursued their challenge with a 4-0 home win over South rivals Oban Camanachd. Kingussie won 4-2 away to Locaber and Skye grabbed a modest lifeline against the drop with a 1-0 defeat of already relegated Glenurquhart in Drumnadrochit. Kilmallie clinched the National Division title with a 3-2 home success over Glasgow Mid Argyll. Drew MacDonald struck for Newtonmore just after the hour and Glen MacKintosh's stoppage-time penalty ensured they now need just two points from two games to clinch their eighth title in nine years. Marc MacLachlan, Graeme MacMillan and Lewis Tawse all got one in each half for Lovat and Greg Matheson also netted while Craig Morrison and Blair Morrison replied for Caberfeidh. At Tighnabruich, Scott MacDonald got an early breakthrough for Kyles and Gordon White made the half-time score 2-0. Colin MacDonald and a late penalty from Robbie MacLeod completed the scoring. Roddy Young grabbed a hat-trick for Kingussie, who also had Liam Borthwick and Ruaraidh Anderson on target. Findlay MacDonald and Stuart Callison replied for Lochaber who, along with Cabers, could still be caught by Skye, whose Rory MacLeod got their crucial goal. Kilmallie seemed to be cruising to the second-tier title when Calum MacDonald with two and Liam MacDonald with one made it 3-0 at half-time. However, Mid Argyll's John McNulty and Calum McLay created an anxious last half-hour for the eventual champions. Fort William maintained their claim for the second promotion place when Alexander MacMillan gave them a 1-0 victory in Inverness. Ross MacMillan got four as Oban Celtic overwhelmed Beauly 7-2.